Truro, NS – Starting Thursday March 5th and running until Wednesday March 18th, the Colchester East Hants Hospice, in partnership with select Sobeys and Foodland stores, will be holding the Food from the Heart program. 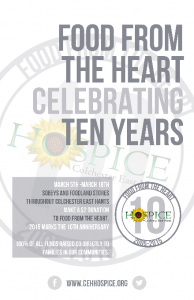 Participating Sobeys and Foodland stores throughout Colchester East Hants will be appealing to customers to make a $2 donation to the Hospice Food from the Heart Program. 2015 marks the 10th anniversary of the Food From the Heart program. A key component of Hospice services, Food from the Heart has proven to be a crucial program. Over the past ten years families in need of assistance, as identified by the Palliative Care Program, have been provided grocery cards on a bi-weekly basis that can be used at Foodland or Sobeys. Serving an average of 10 families per month, Food from the Heart helps to relieve financial pressure experienced by families facing end of life. An increased awareness of the program among patients, and palliative care nurses, has resulted in more people accessing Food from the Heart. With this success has come a greater need for program funding. We invite you to consider donating to this program by visiting your local Sobeys or Foodland store from March 5th-18th. Your donations directly impact families in Colchester East-Hants! Individuals can also donate by visiting the Hospice Centre at 89 Queen Street, Truro.